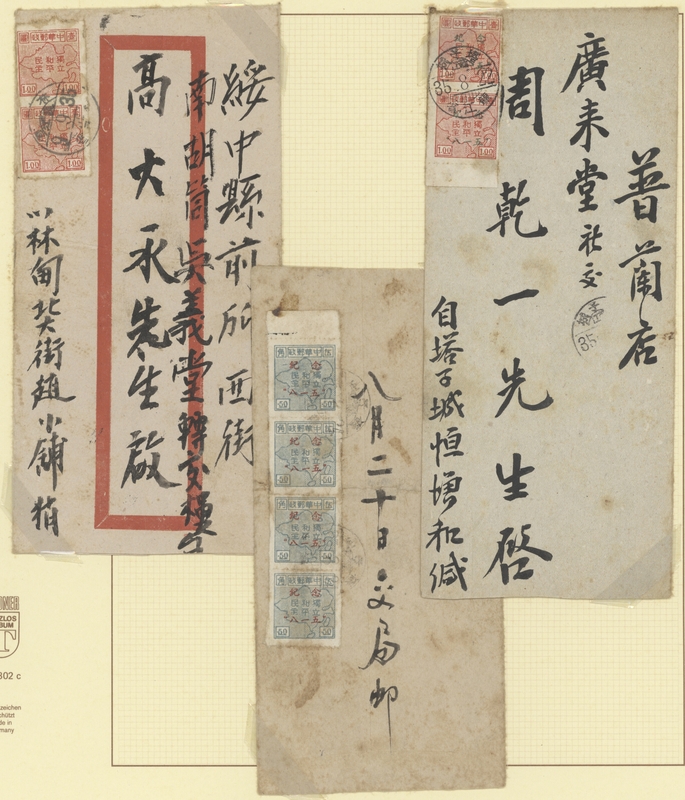 5269 Brief (cover) Northeast China, Jilin Area, Tumen Local Issue, 1946, "Yanbian Subregion Chinese Postal Service", domestic cover bearing $2/10c, tied Antu (?? 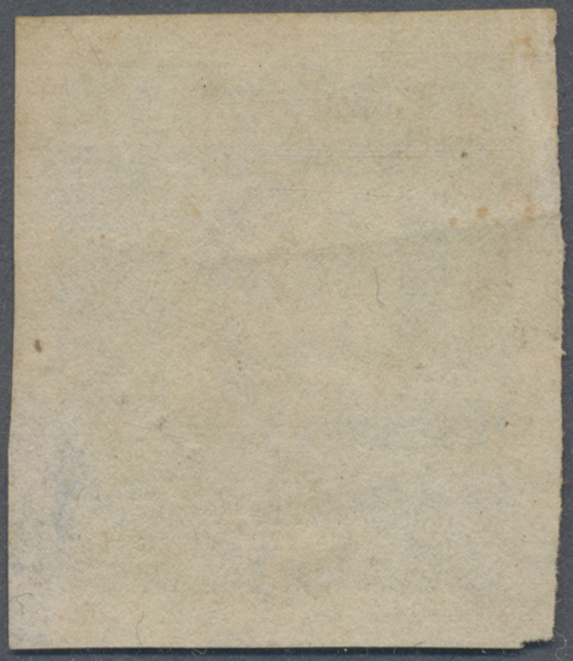 ), 23 May 1946, very fine, as is (unlisted). 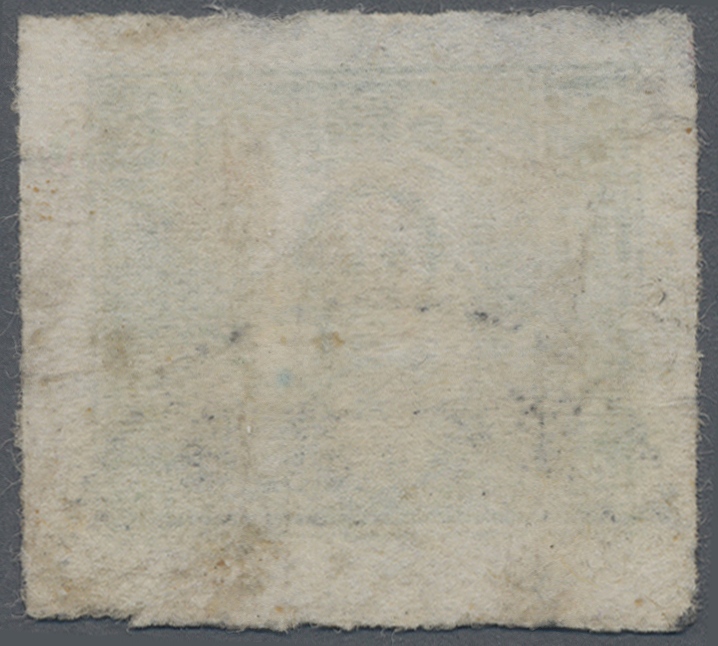 5270 ungebraucht (hinged) * gestempelt (marked) Brief (cover) Northeast China, Heilongjiang District, Bei’an (??) 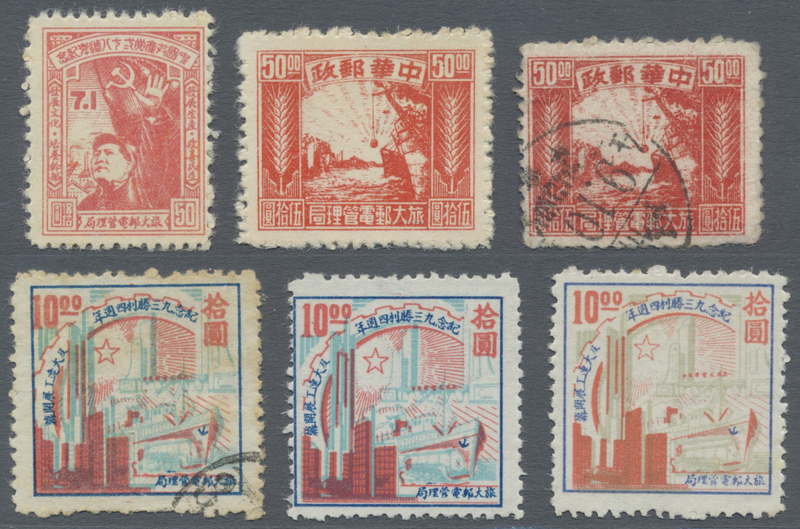 Local Issue, 1946, "Chinese Postal Service Temporarily Used and new value", $1/2c - $5/12c, 2 cpl. 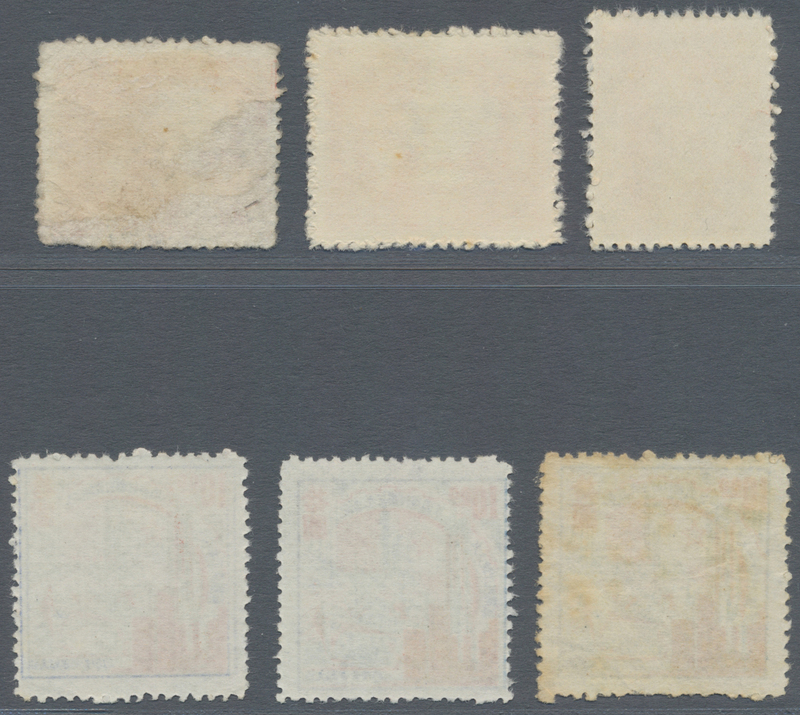 set of 2 (mint hinge remnant and used), F-VF, 2 domestic covers bearing $1/2c or $5/12c, F-VF (Mizuhara DB321-322). 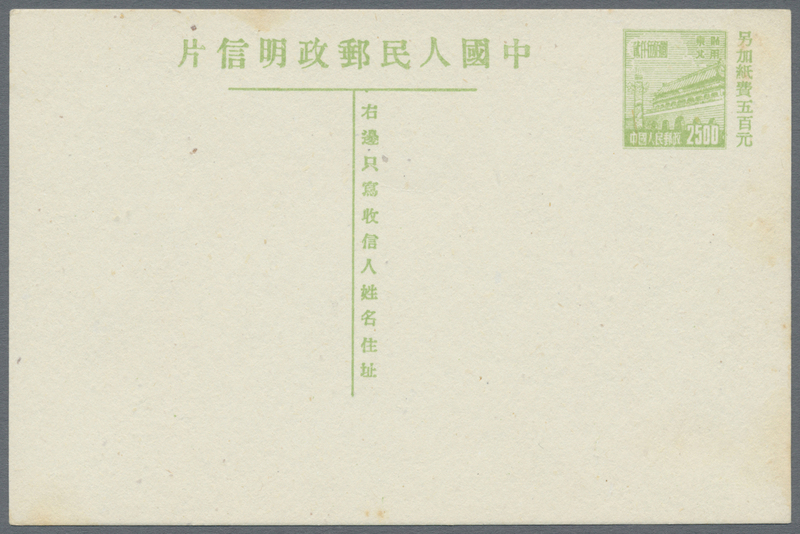 5271 Brief (cover) Northeast China, Heilongjiang District, Heihe (??) 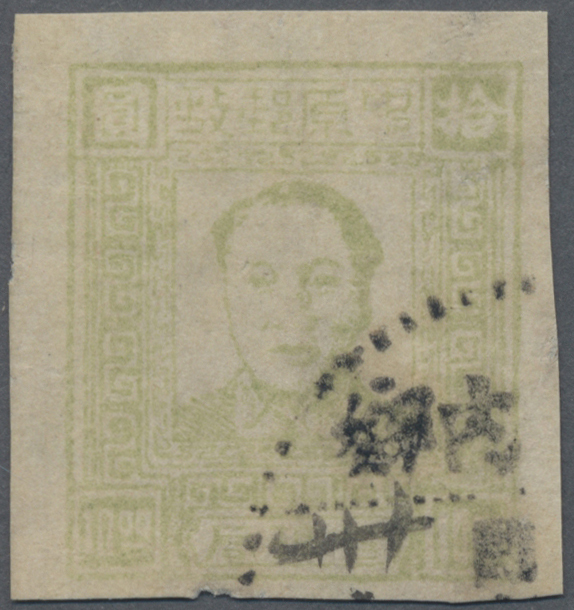 Local Issue, 1946, "China Temporarily Used and new value" ovpt., domestic cover bearing vertical stripe of 2 of 50c/5c, F-VF. Heilongjiang District, Suibin (??) 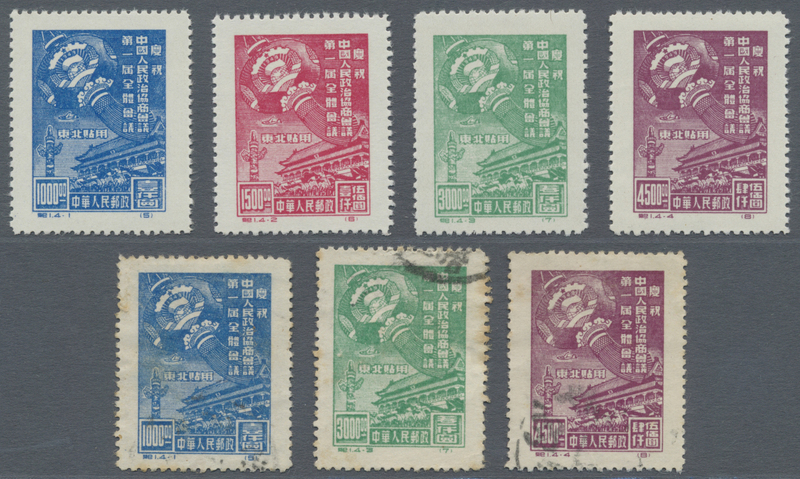 Local Issue, 1946, Postage Paid Cover, bearing blue chop Chinese Post (???? ), Postage Paid (???? ), Suibin (?? ), F-VF (Mizuhara DB324, Kerr 202). 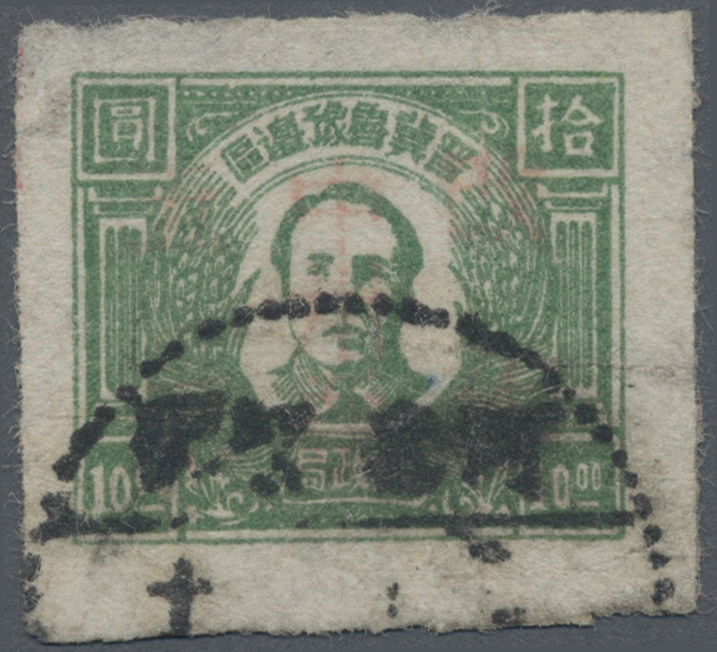 5272 ungebraucht (hinged) * gestempelt (marked) Brief (cover) Northeast China, Heilongjiang District, Jiamusi (???) 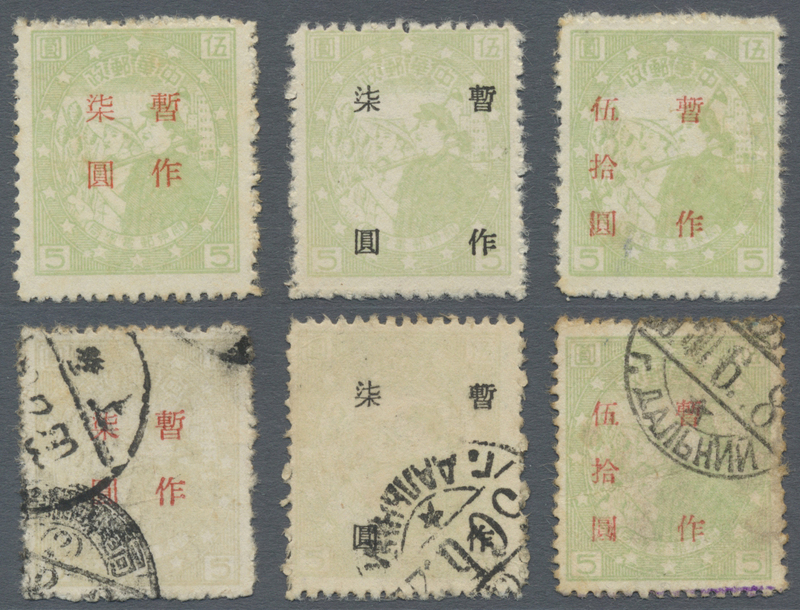 Local Issue, 1946, "Chinese Post Temporarily Used for and new value" ovpt., $1/4c, $2/7c, each in mint hinge remnant and used, F-VF, additional 1 domestic cover bearing vertical stripe of 2 of $2/7c, tied 16 July 1946, Jiamusi (??? ), Sanjiang Province (???). Heilongjiang District, Mudanjiang (???) 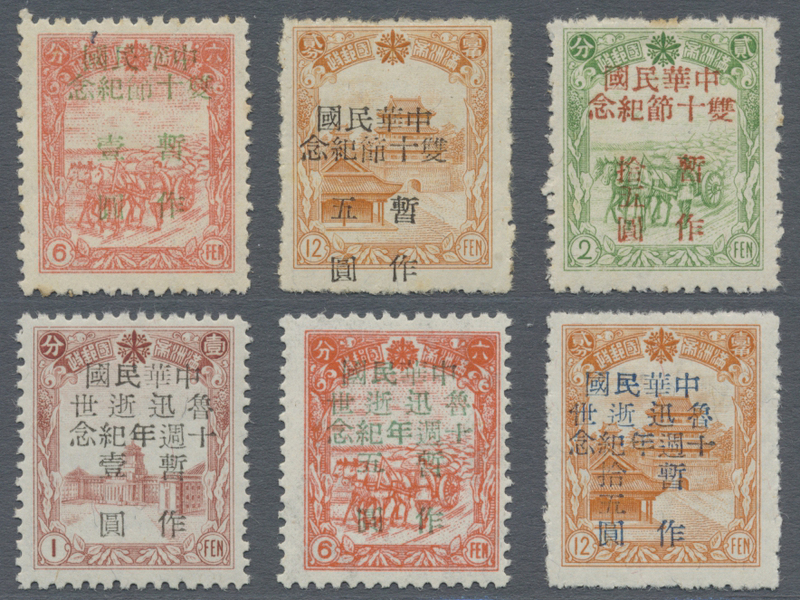 Local Issue, 1946, "Commemorating 1st Anniversary of Recovering Northeast on 15 August (Sui You) and new value" ovpt., $5/6c, mint hinge remnant, F-VF (Kerr 91.10-11, Mizuhara DB333). 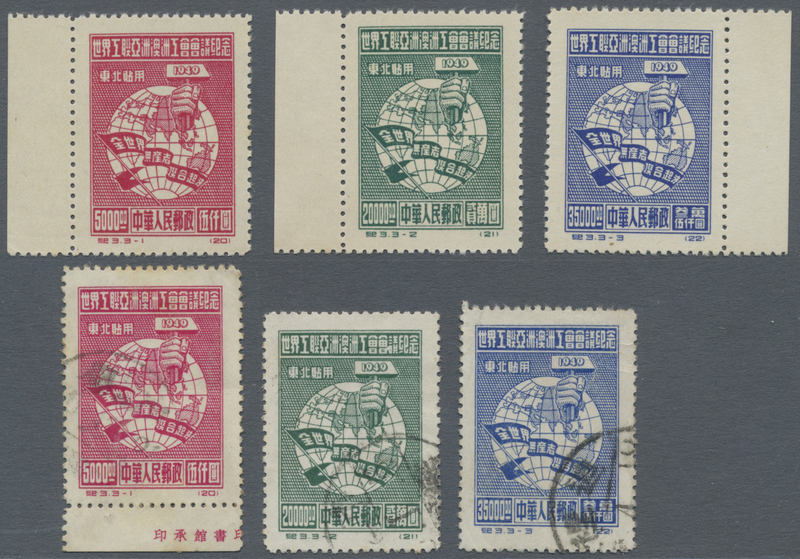 5277 ungebraucht ohne Gummi (unused without gum) (*) 2-4B Northeast China, Northeast People’s Post, 1950, "Locomotive Parcel Post Stamps (Northeast)", $300.000 - $1.000.000, imperf., mint no gum as issued, $1.000.000 with light horizontal crease otherwise VF, (Yang NEP5-7). 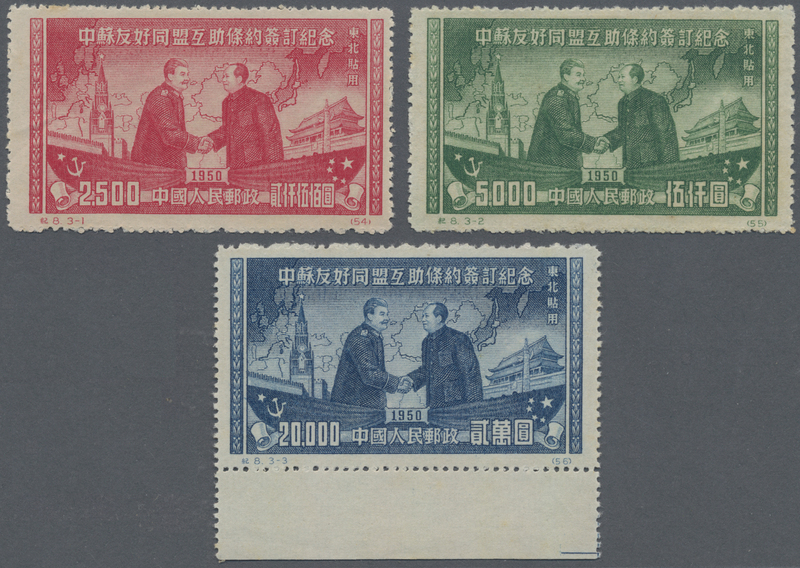 5278 ungebraucht ohne Gummi (unused without gum) (*) gestempelt (marked) 143I-146I Northeast China, North China Post Office, 1949, "Celebration of the First Plenary Session of the Chinese People’s Political Consultative Conference", $1.000 - $4.500, cpl. 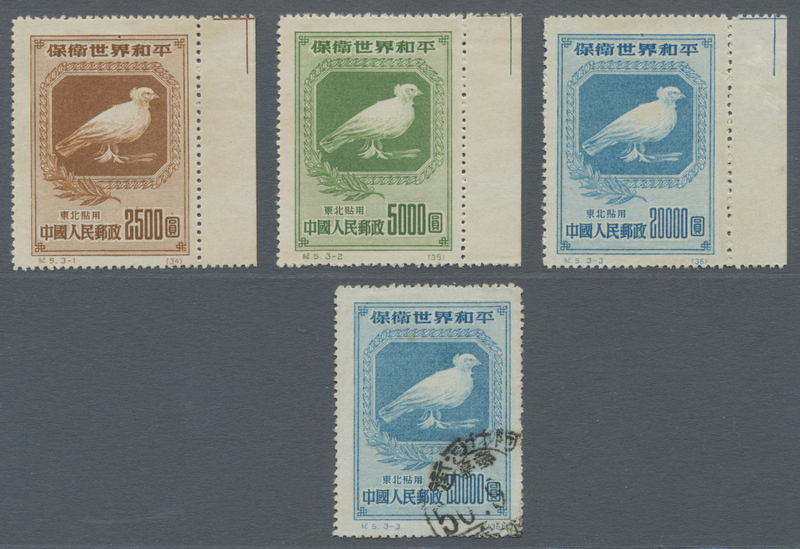 set of 4, originals, mint no gum as issued, VF, additional 3 used copies, these with faults (Yang C1NE). 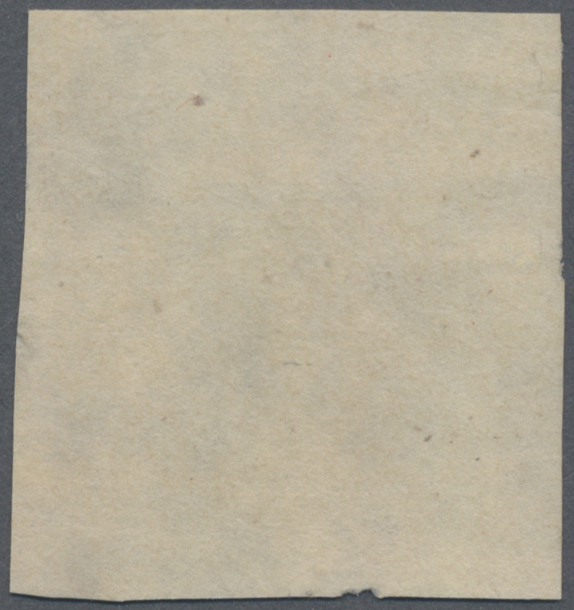 5279 ungebraucht ohne Gummi (unused without gum) (*) gestempelt (marked) 158I-161I Northeast China, North China Post Office, 1950, "Chinese People’s Political Consultative Conference", $1.000 - $20.000, cpl. 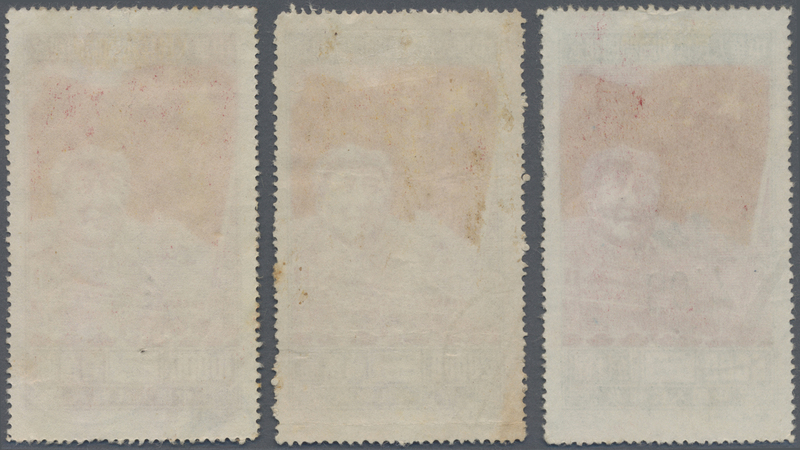 set of 4, originals, mint no gum as issued, VF, additional 1 used copy, this with faults (Yang C2NE). 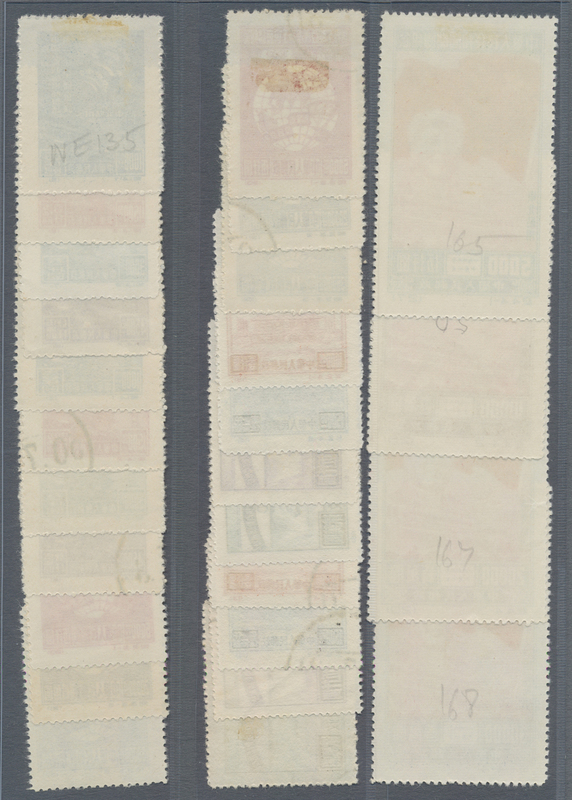 5280 ungebraucht ohne Gummi (unused without gum) (*) gestempelt (marked) 155I-157I Northeast China, North China Post Office, 1949, "World Federation of Trade Unions – Asian Australian Trade Union Conference", $5.000 - $35.000, cpl. set of 3, originals, mint no gum as issued, VF, additional cpl. set of 3 used copies, these with faults (Yang C3NE). 5281 ungebraucht ohne Gummi (unused without gum) (*) gestempelt (marked) 172I-175I Northeast China, State General Administration of Posts, 1950, "The Founding of the People’s Republic of China", $5.000 - $30.000, cpl. 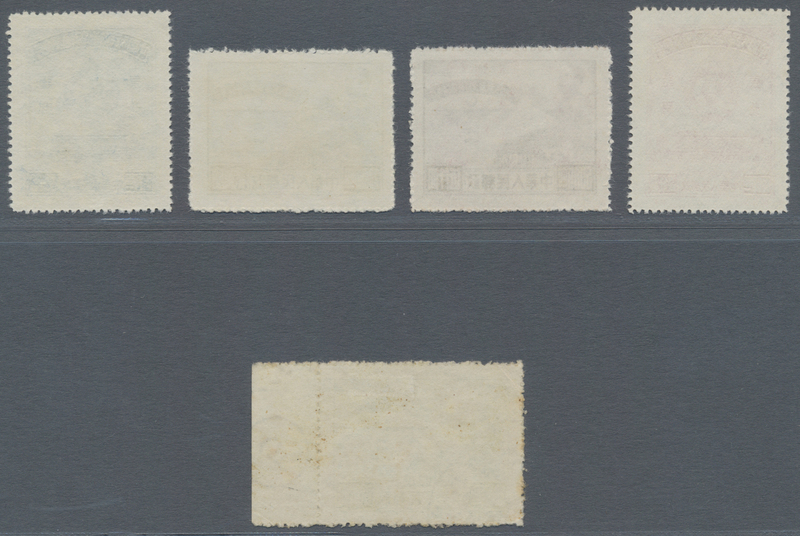 set of 4, originals, mint no gum as issued, VF, additional 3 used copies, these with small faults (Yang C4NE). 5282 ungebraucht ohne Gummi (unused without gum) (*) gestempelt (marked) 176I-178I Northeast China, State General Administration of Posts, 1950, "Defending World Peace", $2.500 - $20.000, cpl. set of 3, originals, mint no gum as issued, $2.500 and $20.000 small pin hole otherwise VF, additional 1 used copy $20.000, F (Yang C5NE). 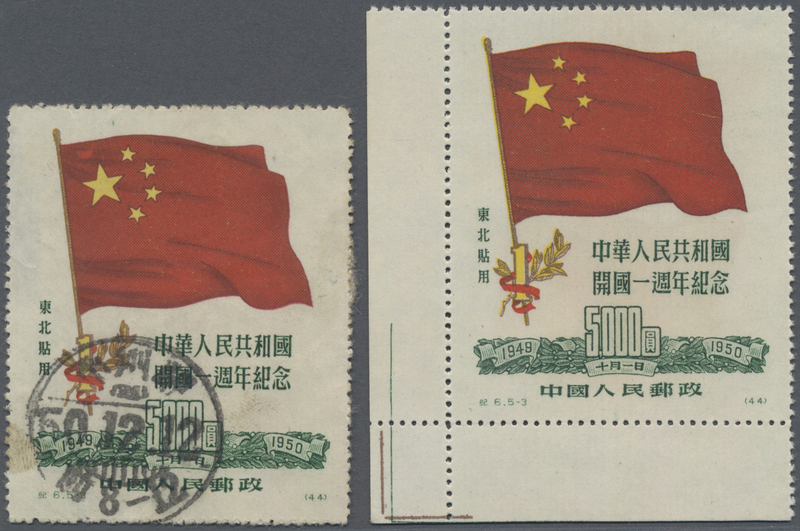 5283 ungebraucht ohne Gummi (unused without gum) (*) gestempelt (marked) 179I-183I Northeast China, China Ministry of Posts and Telecommunications, 1950, "1st Anniversary of the Founding of the People’s Republic of China", $1.000 - $20.000, cpl. set of 5, originals, mint no gum as issued, VF, additional 3 used copies, F (Yang C6NE). 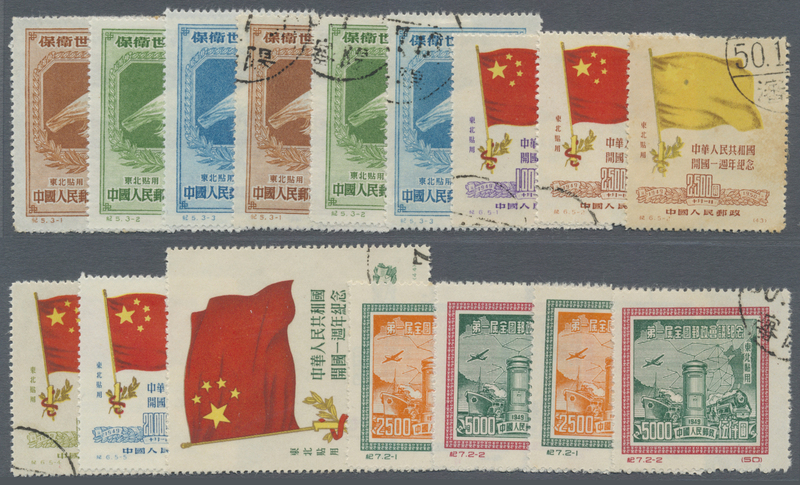 5284 ungebraucht ohne Gummi (unused without gum) (*) gestempelt (marked) 184I-185I, 198I-200I Northeast China, China Ministry of Posts and Telecommunications, 1950, "First National Postal Conference", $2.500 - $5.000, cpl. set of 2, originals, mint no gum as issued, hinge remnant, F-VF, additional cpl. set of 2, these with small faults (Yang C7NE). 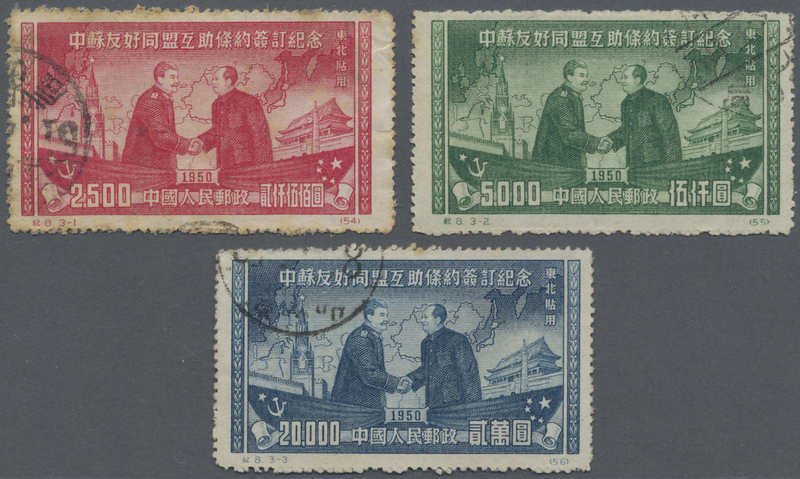 "Memorial of Signing Sino-Soviet Treaty of Friendship, Alliance and Mutual Assistance", $2.500 - $20.000, cpl. 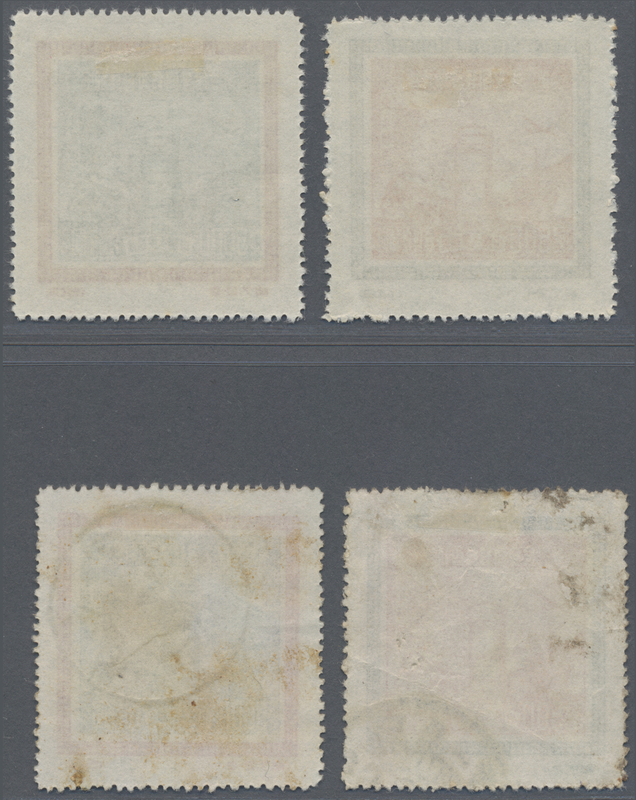 set of 3, originals, mint no gum as issued, hinge remnant, $2.500 with crease, otherwise F-VF, additional cpl. 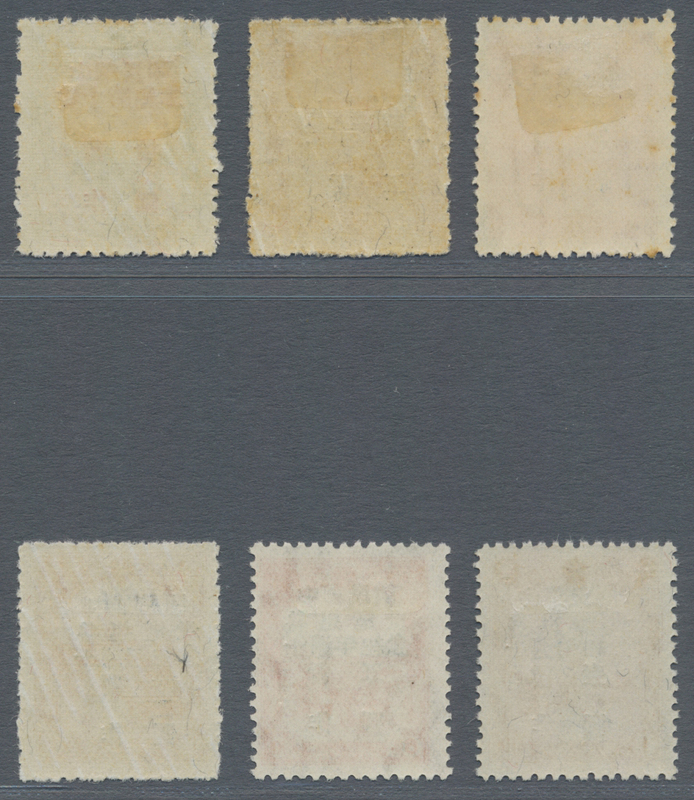 set of 3, these with faults (Yang C8NE). 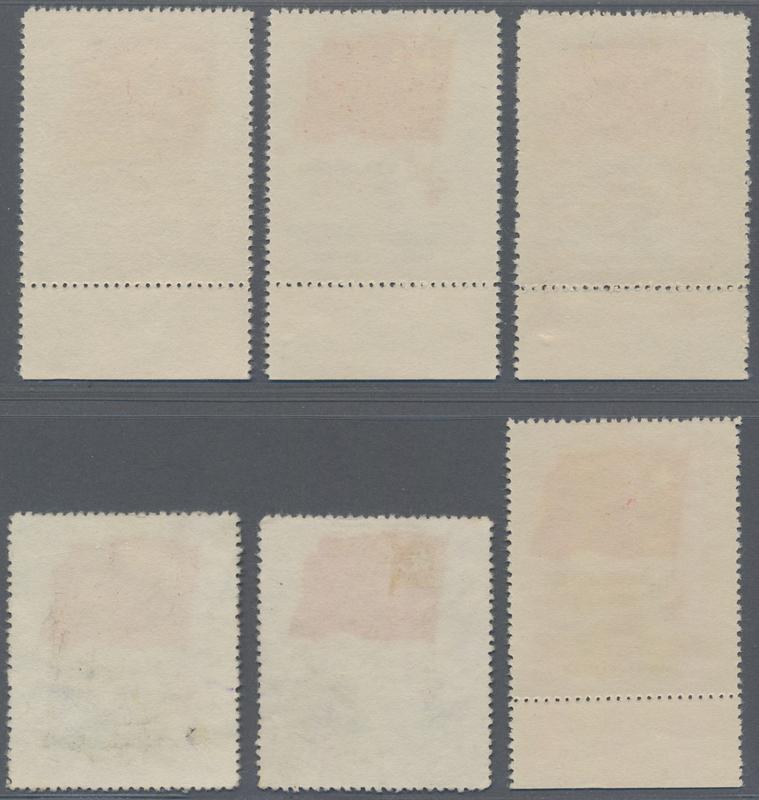 5285 ungebraucht ohne Gummi (unused without gum) (*) gefälligkeitsgestempelt (complaisance-marked) 143II-146II, 155II-1 Northeast China, 1955, assembly of official reprints, 8 cpl. 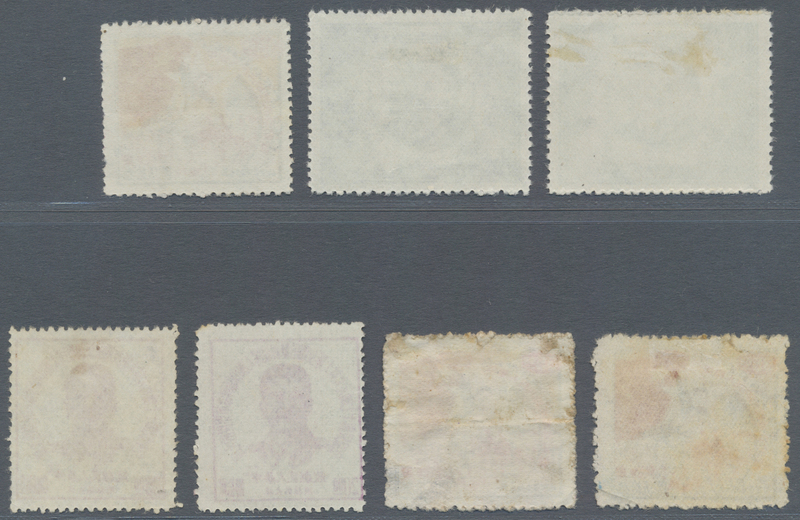 sets, mint no gum as issued or used (CTO), some faults, total 48 copies (Yang C1NE-8NE reprint). 5293 ungebraucht (hinged) * gestempelt (marked) ungebraucht ohne Gummi (unused without gum) (*) 45-47 Luda Region, Luda People’s Post, 1948, "In Commemoration of 30th Anniversary of Soviet Army Day Temporarily Used for and new value" ovpt., $10/2c - $100/(-), cpl. 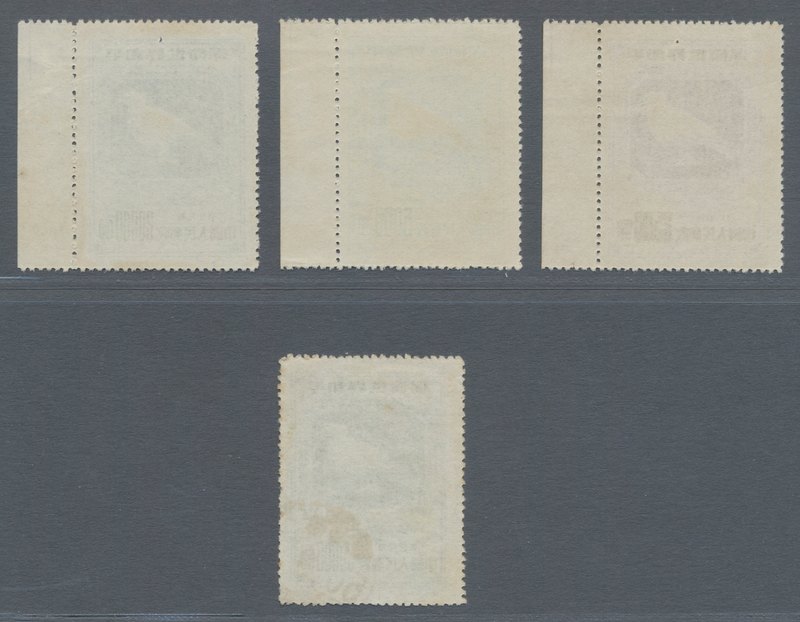 set of 3, fine used, VF, 1 mint hinge remnant copy ($20/6c) and 1 mint seal label "2600th Anniversary of Japanese Empire", mint no gum (as usual), F-VF (Yang AD32c, AD33-34). 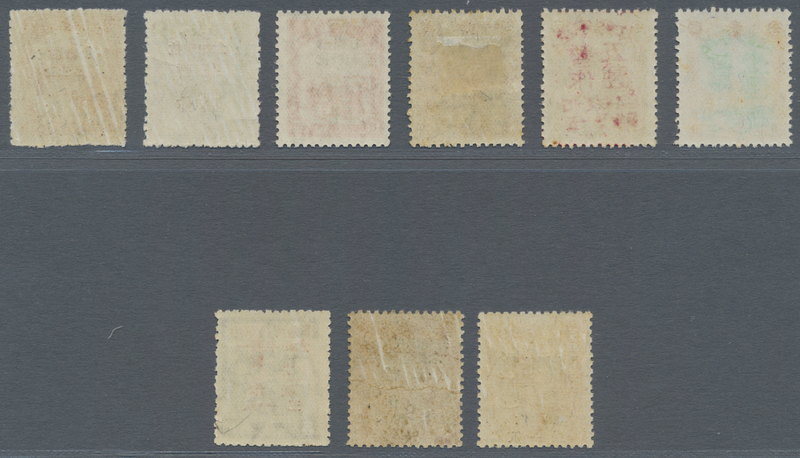 Yang AD32c with signature "YANGS"
5295 ungebraucht ohne Gummi (unused without gum) (*) postfrisch (never hinged) ** gestempelt (marked) 48-49, 56-58 Luda Region, Luda People’s Post, 1948, "Chinese Post / Guandong Posts Temporarily Used for and new value" ovpt., $10/2c - $50/1c, cpl. set of 2, used, $10/2c repaired at bottom, otherwise fine (Yang AD41-42). 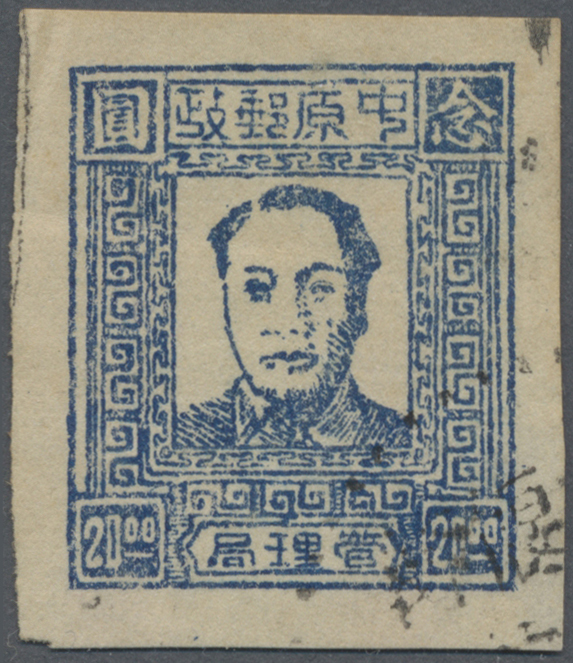 "Guandong Post In Commemoration of Congress of Guandong Agriculture Model Workers and Exhibition Temporarily Used for and new value" ovpt., $10/2c, mint no gum, some toning (Yang AD43). 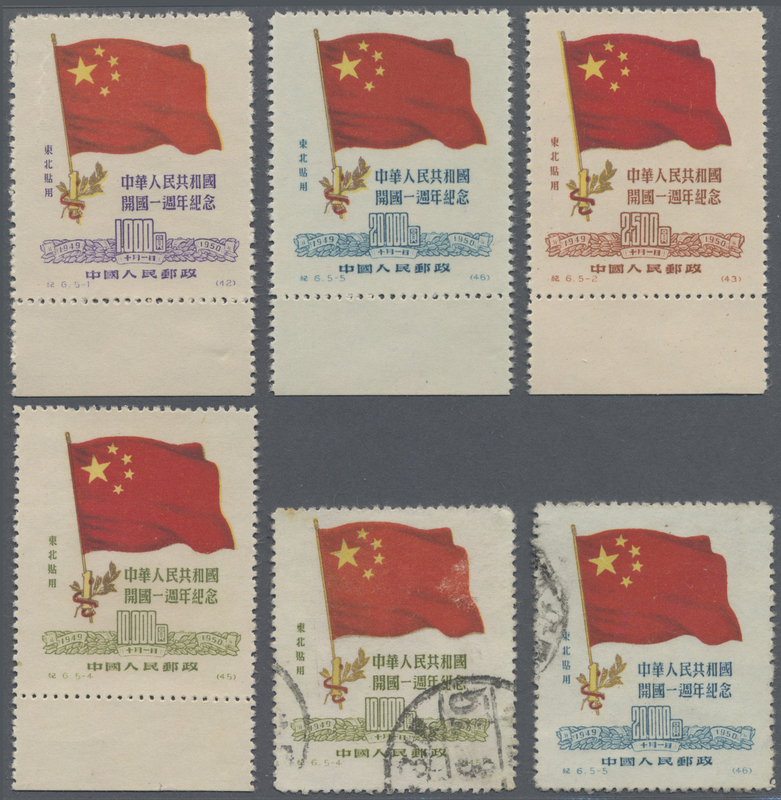 1949, "Chinese Post / Guandong Posts Temporarily Used for and new value" ovpt., $5/3c mint no hinge, VF, $10/1c used, F-VF (Yang AD45-46). 5296 ungebraucht ohne Gummi (unused without gum) (*) ungebraucht (hinged) * gestempelt (marked) 63-66 Luda Region, Luda People’s Post, 1949, "Production and Communication Issue", $5 - $50, 2 cpl. 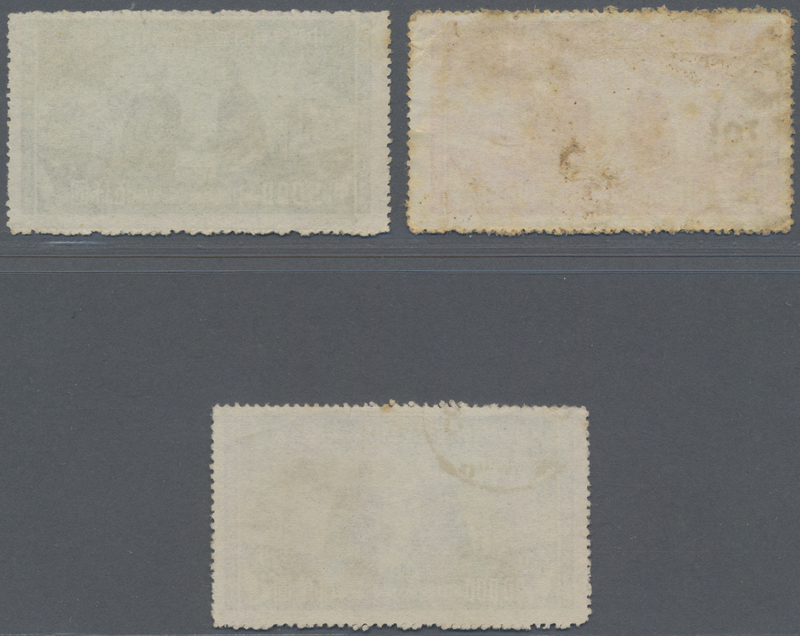 sets of 3, mint no gum / hinge remnant, F-VF additional 1 cpl. 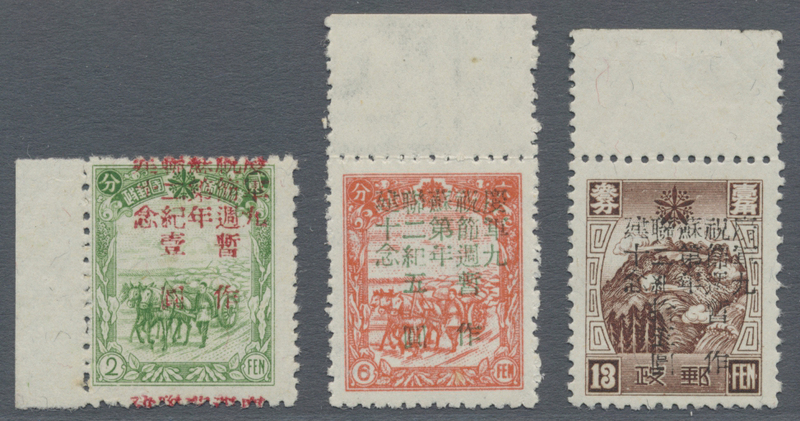 set of 3 used, VF (Yang AD49-51). "May 1st International Labor Day Issue", $10, original and reprint, mint no gum as issued, VF (Yang AD52-53). 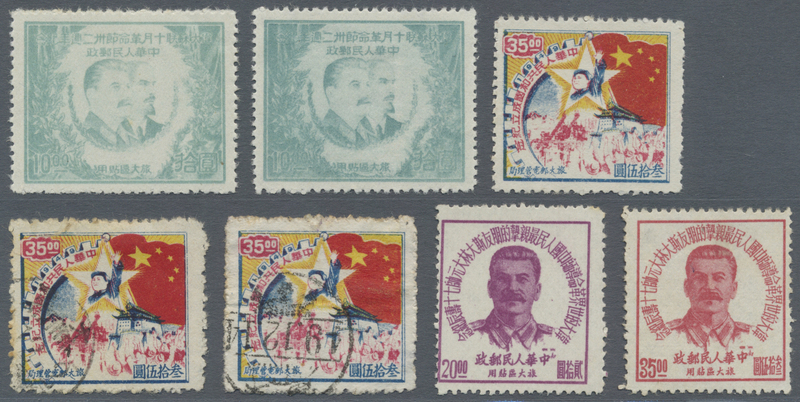 5297 ungebraucht ohne Gummi (unused without gum) (*) 67-69 Luda Region, Luda People’s Post, 1949, "28th Anniversary of Communists Party of China Issue", $50, mint no gum as issued, F-VF (Yang AD54). "Transportation Issue", $50, mint no gum as issued and used, VF (Yang AD55). 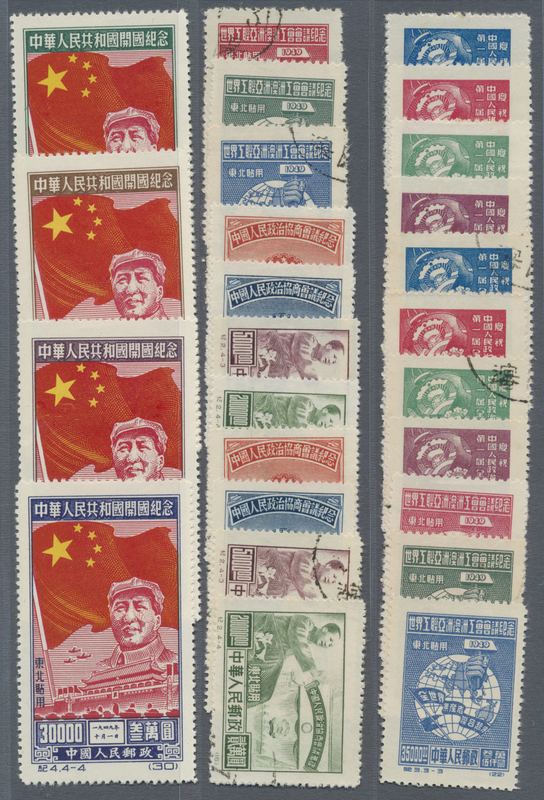 "Victory on September 3rd / Opening of Dailan Industrial Exhibition", $10, original and reprint, mint no gum as issued, VF, 1 used original copy with faults (Yang AD56-57). 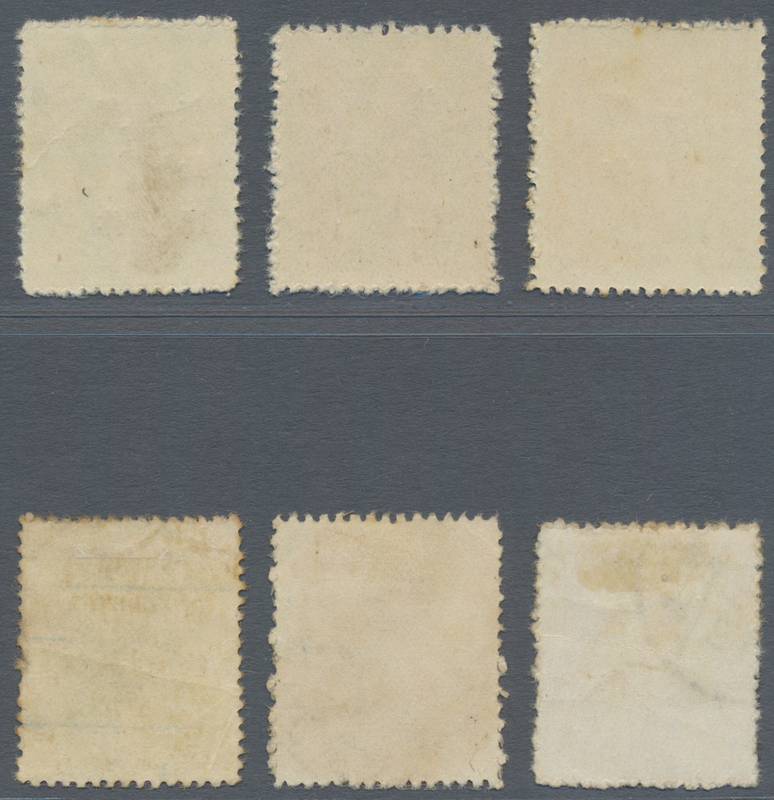 5298 postfrisch (never hinged) ** gestempelt (marked) 74-75 Luda Region, Luda People’s Post, 1949, "Temporarily Used for and new value" ovpt., $7/$5 - $50/$5, mint never hinged, $7/$5 some toning, otherwise F-VF, additional $7/$5 - $50/$5, fine used, F-VF, total 6 stamps (Yang AD58-60). 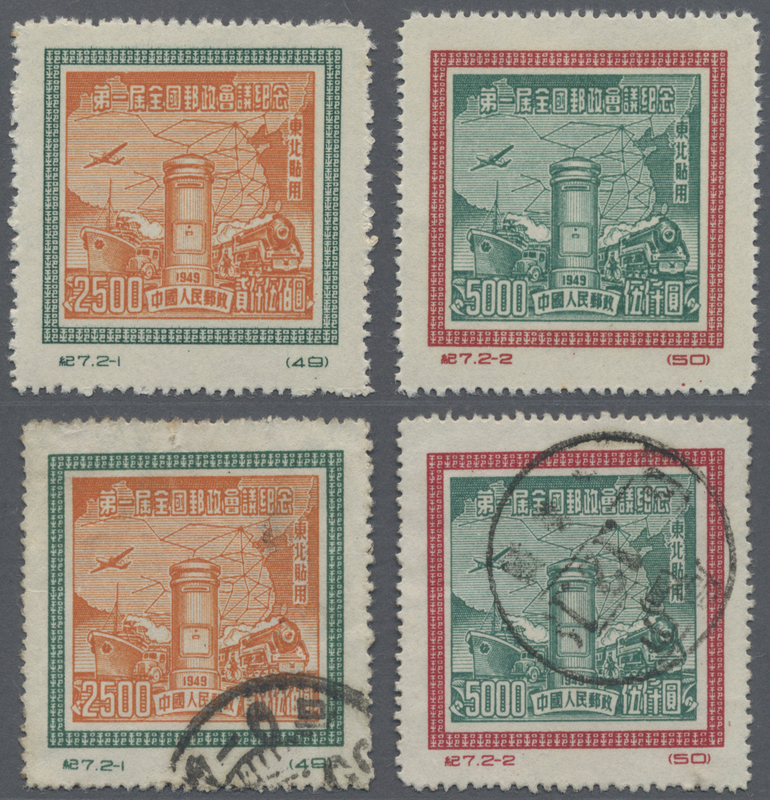 5299 ungebraucht ohne Gummi (unused without gum) (*) ungebraucht (hinged) * gestempelt (marked) 70-73 Luda Region, Luda People’s Post, 1949, "Founding of People’s Republic of China", $35, mint no gum as issued, VF, additional 2 copies used on thin / thick paper variety, these with faults (Yang AD64). 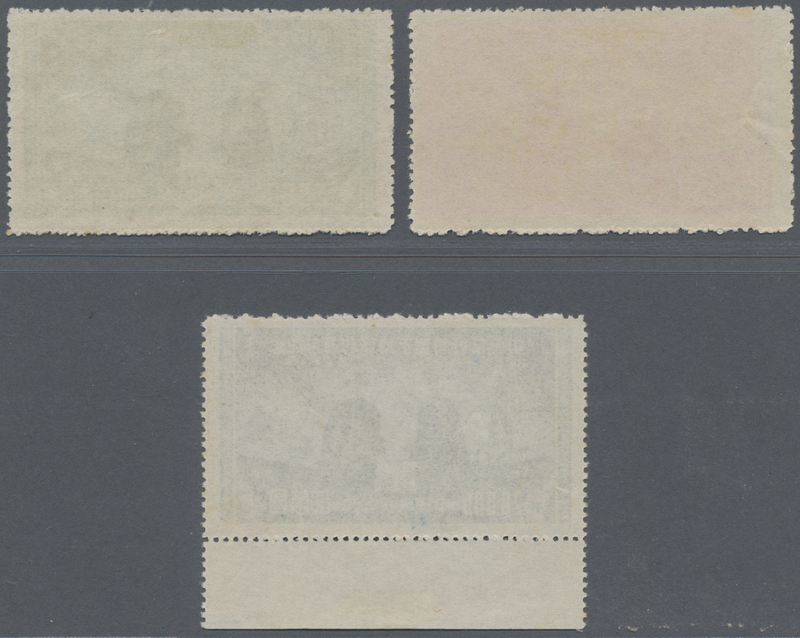 "32nd Anniversary of October Revolution", $10, mint hinge remnant, 2 copies, F, (Yang AD63). "70th Birthday of Josef Stalin", $20 - $35, cpl. 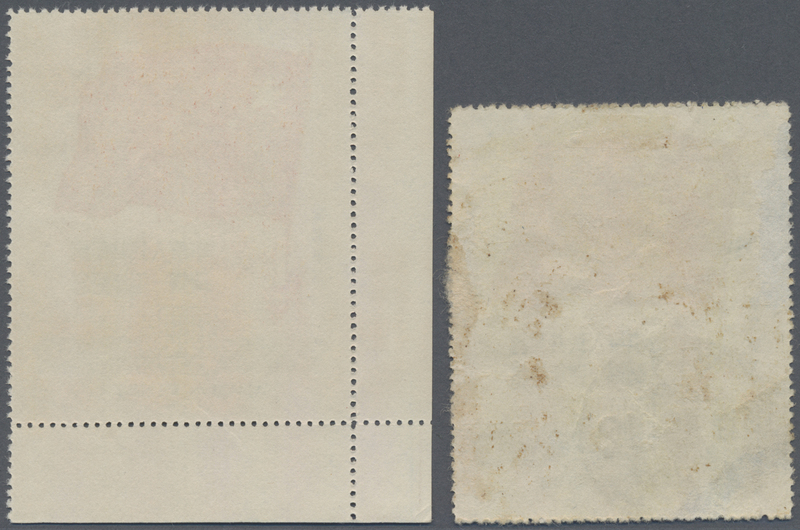 set of 2, unused no gum as issued, VF (Yang AD65-66). 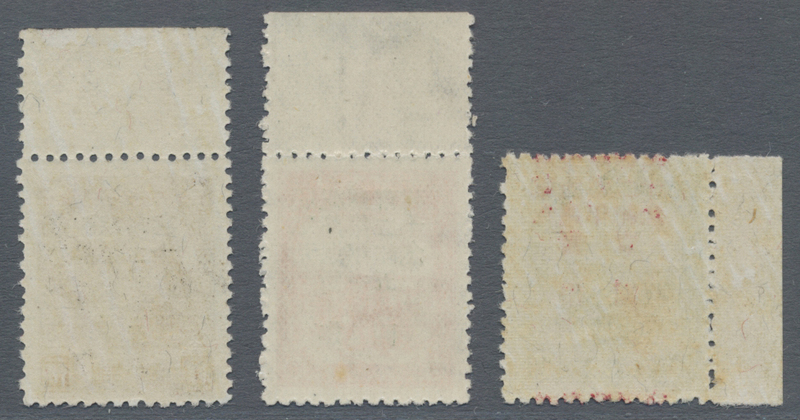 5300 postfrisch (never hinged) ** gestempelt (marked) 78-79 Luda Region, Luda People’s Post, 1950, "Temporarily Used for and new value" ovpt., $500/$5 - $500/$10, cpl. 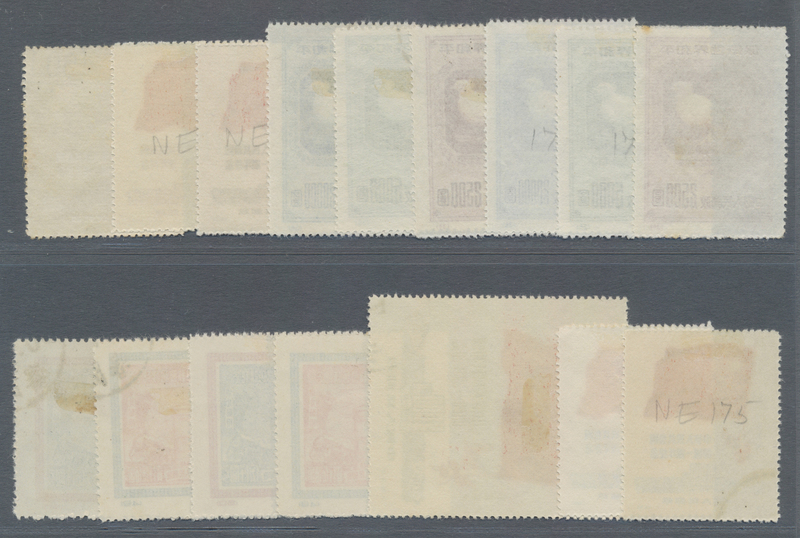 set of 2, mint never hinged, VF, additional $500/$10, used (CTO), VF, total 3 stamps (Yang AD67-68). 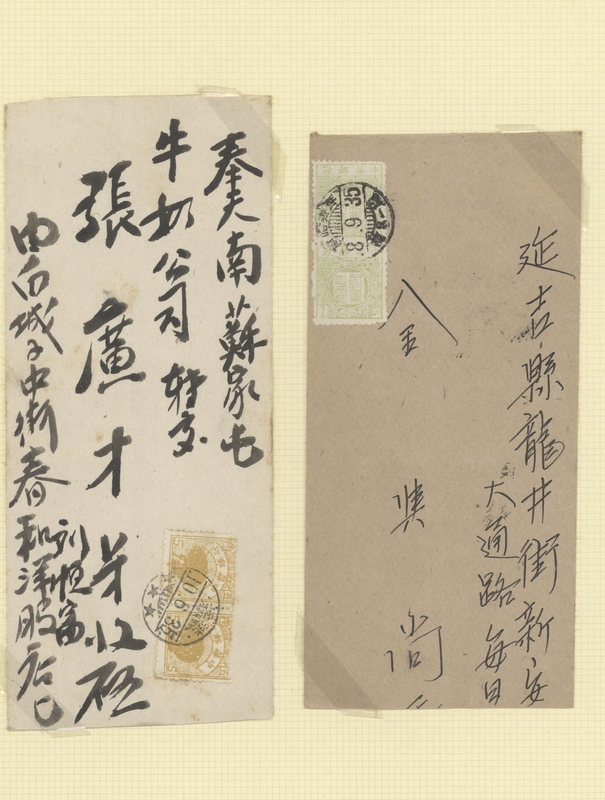 Yang AD68 used with signature "H.L.CHUNG". 5302 ungebraucht ohne Gummi (unused without gum) (*) 80-84 Luda Region, Luda People’s Post, 1950, "Tian An Men Issue", $10 - $100, cpl. set of 5, unused no gum as issued, $10 - $20 right side short perf., otherwise VF (Yang AD69-73). 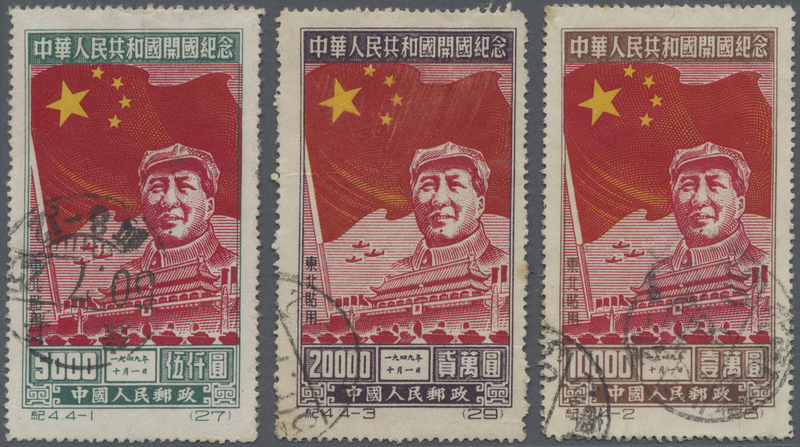 5308 ungebraucht ohne Gummi (unused without gum) (*) gestempelt (marked) 9-14, 28-30 China Central Plains, Zhongzhou Area, 1948, "1st Kaifeng Print Mao Zedong Issue", $1 -$42, cpl. 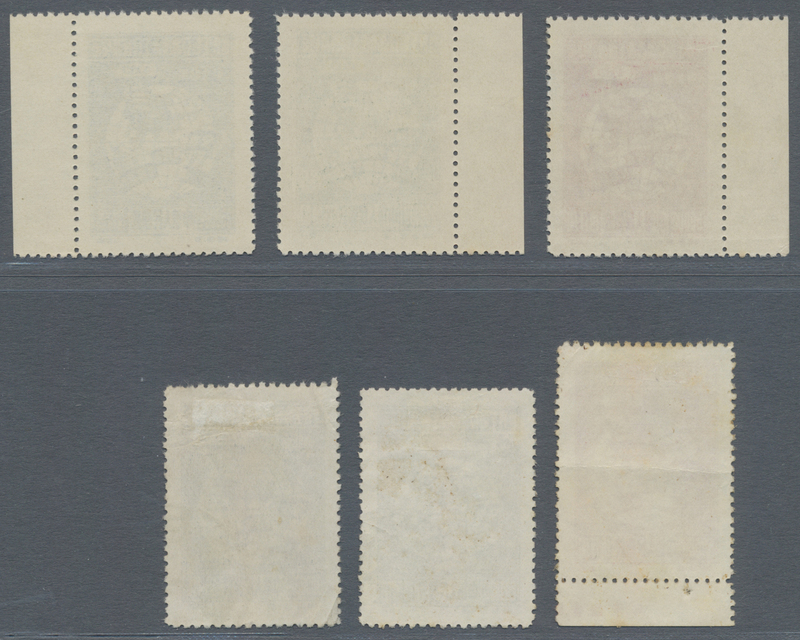 set of 6, mint no gum as issued, additional 4 used copies, F-VF (Yang CC15-20). 1949, "Changed to and new value" ovpt., $1/$26 - $25/$42, cpl. 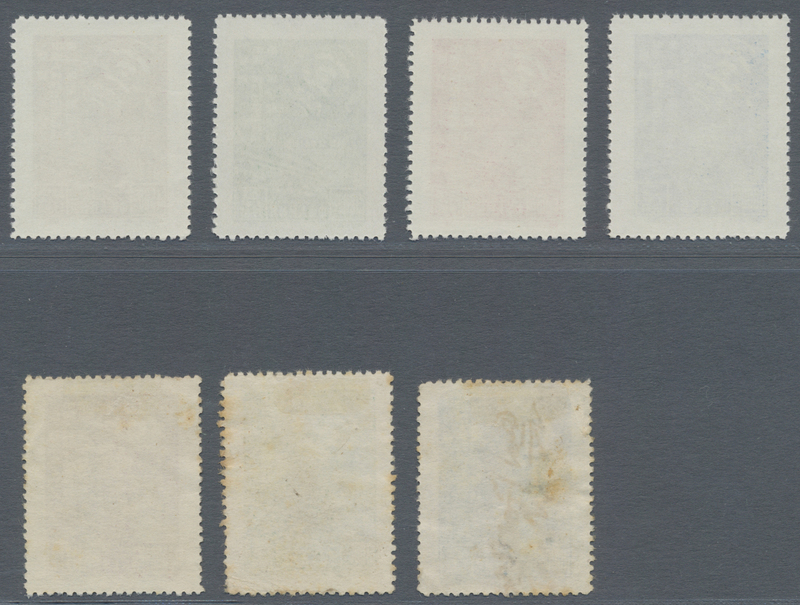 set of 3, mint no gum as issued, additional 2 used copies, F-VF (Yang CC35-37).